There is a saying that “Traveling is the best Way to discover the World”. During travel you visit unknown places, see foreign cultures, experience different ways of living and meet new people. In the end, it all comes down to being open-minded. We all have our individual roots and homes – but in order to understand our own selves better, it can help to see other lifestyles. Being open-minded also applies to Brazilian Jiu Jitsu. The sport of BJJ is growing, the techniques are evolving and new generations are starting to influence the sport. Leaving our home base and training at other places helps us discover new approaches to solving a problem in jiu jitsu. Some solutions will open our eyes because we have never heard about them before, others make sense but maybe are not useful for our own game plan. If you enjoy Brazilian Jiu Jitsu you probably enjoy traveling, too, because they both share a certain desire for more information. We always say that in BJJ there is no place for your ego. This is true if you want to learn, if you want to evolve and if you want to understand the Art more. I think that if you are a competitor, it is important to show some strong ego. But traveling with your ego is a waste of time. You cannot experience new places while telling yourself “at home it is much nicer” or “at home we have the same” etc. If you cannot free your mind from what you already know it is hard to be open for something new. Very often our attitude is the key how to see live. It is all about our mind whether we can remove the scales from our eyes for something new or not. Our thoughts are the biggest obstacle regarding how to go through life. Learn more about yourself. If you leave your comfort zone you have to be able to handle new situations. You have to discover not only new areas but also have to be able to feel “comfortable in uncomfortable situations” [Rickson Gracie]. How do I react in between new people? Who is the alpha male in this group and how can I approach him? Can I talk to people the same way I talk to my friends at home? Is it okay to ask a black belt to roll with me or not? How do I feel in this new environment? Do I like this group or am I out of place? Do they really want to help me or do they only want to collect my money? Do I enjoy myself around these people? If you leave home you have to find your place in a new group. Wherever you are, you play a certain role in your peer group. Are you the funny guy, the alpha male, a nobody, the guy who defines what to do or not? People are going to treat you different than at home. People are going to roll different with you than at home. Among friends and teammates you do not have to talk about the etiquette of your school. You know the rules and they know the rules, too. But in a new academy there can be a different common sense than you are used to back home. Ask yourself: Is it easy for me to be part of a new group and accept new rules? Am I someone who is able to learn from anybody or not? How do I treat people? If they are better than me do I treat them different then if they have a lower rank? Do I only want to get taught by the main instructor of the new place or do I also accept high or low rank students to teach me their go-to-moves? When I come back home, how do I talk about the places I visit? Do I see only what they have what we do not have at our academy or do I just see what I did not like? Am I open-minded and can I see how much effort people put in order to achieve their goals? Talking to friends you always hear about their techniques. You watch BJJ stars on Youtube and see their technical greatness. They produce world class champions and have the ideal training environment. During my BJJ journeys, I had the honor to train with an amazing BJJ competition team. When I visited this academy with more than 400 students and most of them were competitors I felt like in BJJ heaven. After training there and observing their daily stresses and strains during practice, I see things different now. Most often they train 3 to 4 times a day and in between they eat, sleep and relax for the next training. And if you want to get gold medals this is what you have to do, right? But when you meet these champions you realize that most of them do not give their bodies time to recover after a heavy competition or after an injury because they soon have to fight again in order to earn money. What you normally don’t see is that they carry injuries for a long time and suffer pain every day they train. Of course they do what they love but they pay a very high price. Do not get me wrong – these guys are my heroes, my role models but this does not mean anymore that I want to change with them. They are my heros in BJJ, not in live. They are not my heros when I think how to handle a family, they are not my heros in talking care of their bodies but concering bjj and technique – yes they are my heros. Getting new motivation is also a great part of traveling. You bring a new drive back to your school where you can also influence your teammates at home. And if they improve you are going to improve, too. Most of us have the possibility to write their own history. But in the end, life has to be an endless learning experience and this is BJJ, too. Traveling and training BJJ are both good ways to improve as a person, as a human being and to discover yourself if you want to. And for me I will never stop doing this – traveling, training BJJ and improving! If I die one day I do not want to be remembered as someone who did everything to win a gold medal, but I want to be remembered as someone who enjoyed learning, who never stopped evolving and someone who supported other people that set off for making the most out of their lives. Editor’s Note: Renato Migliaccio, the newest FiveOuncesOfPain.com columnist, is a decorated martial artist, holding black belts in both Judo and Brazilian Jiu-Jitsu (under the late Ryan Gracie). Additionally, Migliaccio also is considered one to the top lightweight MMA prospects not signed to a major organization with a perfect record of 6-0. In his guest columns that will appear periodically on 5 Oz., Migliaccio will provide his insider’s perspective on martial arts training. In his second submission, Renato talks about the importance in being honorable and staying true to your team and instructor. The other day, a friend of mine who has studied Kung Fu for many years told me that “Sifu” is not a Chinese word for a teacher but rather has a greater meaning of that of a teacher who is also a father. I believe in the principle of that meaning, as there is no value for anything that anyone teaches you. People can take a lot away from you but not what you have learned. Most of the times, a BJJ teacher will help you by teaching you a technique; reinforcing that patience is a tool for the progress; and by showing you that losing is part of the game but while at the same time never allowing you to be comfortable with a loss. An instructor should always motivate you on and off the mat. An good instructor will always be mindful of your safety and always will bring your confidence to the highest point. If this is not the level of instruction you are experiencing, then it means that he or she is not a good example of what being a true black belt is all about. Earlier, I referenced how important it is to respect lineage. For me, I learned from Ryan Gracie, who learned from Carlos Gracie Jr., who learned from Carlos Gracie who learned from Mitsuo Maeda. For me, personally, I don’t need a certificate for someone to prove to me that they are a legitimate black belt if they respect their lineage. However, other people are different. In the times we currently live in, there are those that are so obsessed to get their black belt that they jump from school to school in order to take a quicker and easier path. Many people abandon their roots and forget their loyalty if they become frustrated with their instructor if they see someone who has not trained as long as them achieve a belt promotion before they do. The mistake that some of them are making is that they sacrifice tradition in order to receive a quick promotion from a school or team with no history or lineage. And by changing schools or teams frequently, you might be able to take some short cuts and you might find yourself surrounded by many other fellow students. But by not respecting a lineage and having patience, you might find yourself at a school in which you are surrounded by a large group of people that are not your friends. Those who remain loyal and don’t jump from a team at the first sign of frustration will be rewarded in that they will remain with a school or team that has become a second family — a family that will sacrifice themselves for a higher goal: their friend’s success. The jumpers will never know such a feeling of family. And in many cases, those that jump in order to get their black belts quicker has a tendency to leave his or her “master” because the belt itself is all that mattered and they forget about everything that comes with it. But this is where the big mistake in my previous article. They might find themselves with a black belt but they will also find themselves in a situation where they need to show a certificate to be taken seriously because their belt has no lineage, no school, or team to back it up. Sadly, they not only need a belt but also need a piece of paper. I am not suggesting you should accept everything your instructor does or say. However, you need to recognize early in your training that a school or instructor might not be right for you and move early in your training so that you are able to find a true home and build the kind of roots that can only grow over the course of time. Waiting until you have reached brown or belt black level to break away is the wrong time to leave. Obviously, there are some exceptions to this rule, but more often than not, you should be loyal to the one who promoted you to black belt. When people in Brazil get mad because a partner or a student is now training at another school is understandable. Especially when the student that has defected is either not ready for their promotion or is not mature enough to having decided to train at a different school. This person actually is looking for something in another school and most of the time they don’t know what they are looking or what they are looking for already exists in their school but they simply can’t see it. For example, usually a lot of purple belt students are not fully mature, so they go to another school and they learn habits at this other school which sometimes are not so welcome in their own school. And right there is usually where a big problem starts that ensues to a breakup. This is where maturing comes in, because a good student will always be able to visit another school and not cause conflict at their regular school or guest school because they are respectful there and know the differences between schools. In Judo, you can train in another school but it is mandatory that you ask your teacher first. If you teacher does not believe you are ready to train outside the school, you will not receive permission. But this is where ego becomes a problem. There are times when a teacher will not allow you to go to another place just because it can hurt his or her ego. Or, the ego issue falls squarely onto the shoulders of the student. Who, despite being asked permission and having been denied, still takes it upon themselves to visit another school because they do not respect their teachers and feel like they can do whatever they want. In conclusion, you have to find a good instructor that you believe in. Once you have formed that trust, you must show faith in your instructor even when times are not always good. A good instructor will reciprocate and show faith in you even when times are not good. It is when a team can endure not just success together but failure as well in which a true sense of family is formed. Without the family ties, you will have no sense of belonging and a belt with a history and lineage that will easily become lost. So find a good school, a good instructor, a good environment, and start to belong to something you believe in. When you achieve all of these, you will find it easy to put trust into the choices your instructor makes for you. Do not doubt or be consumed in negative energy, because this is the first step towards a break up. And in time, things will only manifest and you will begin to feel you do not need your instructor or your school, which will only lead to greater problems. 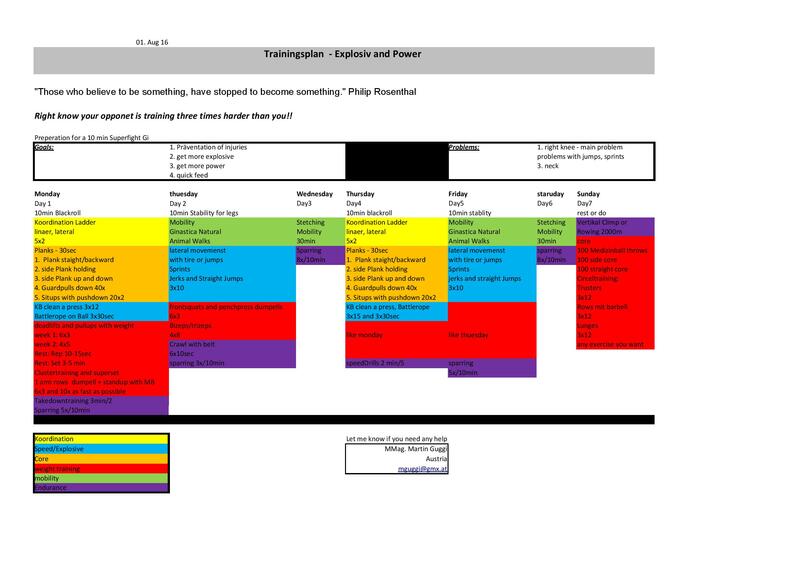 You want to download this trainingsplan? Just klick here ! If you look at the big names in Brazilian Jiu Jitsu, you will find different approaches to conditioning. Marcelo Garcia or Caio Terra for example swear on technique only – “Technique concerns all!” or “If you have to time to go weightlifting, go training BJJ instead”! But if you look on the body from Andre Galvao you see that this guy is big into conditioning. So what is right or wrong? There are different views on the sport. Different training camps where athletes get prepared in different ways. First, we need to see the athlete. Everybody is different. There are small and skinny guys, there are more muscular guys or little and strong guys. If we would know how to train each individual exactly there would be a lot of world champions in BJJ. But that’s not the case. It’s not on the universal way to plan a training camp. Every individual needs a different conditioning and the coach or yourself has to find out the right way for your body type. You cannot copy any high-level competitor and think – if he does it like this, it needs to be good for me too. If you plan your training camp and prepare for competition you need to think about how you get most out of the time you have to train. So how to minimize injuries is a big aspect you have to incorporate in your planning. I am for an example a skinny guy with long legs. I never felt weak or not strong enough for BJJ. But my body is not covered by a lot of muscle mass and I felt so much more stable when I started to incorporate two times a week of weight training in my training camps. It is not to get stronger, the main goal is prevention. Muscle makes you stronger – yes – but they also cover your joints and protect them to not get hurt. If you plan a training camp you need to think about this. Some people have body types where they do need a lot of weight training. Even drilling could be enough for them to feel stable and strong. Some people do not have this gift and they need to incorporate weightlifting in their conditioning programs – not to get stronger is the main goal but to be able to train more, to spar harder and not get injured from these activities in your training camps. 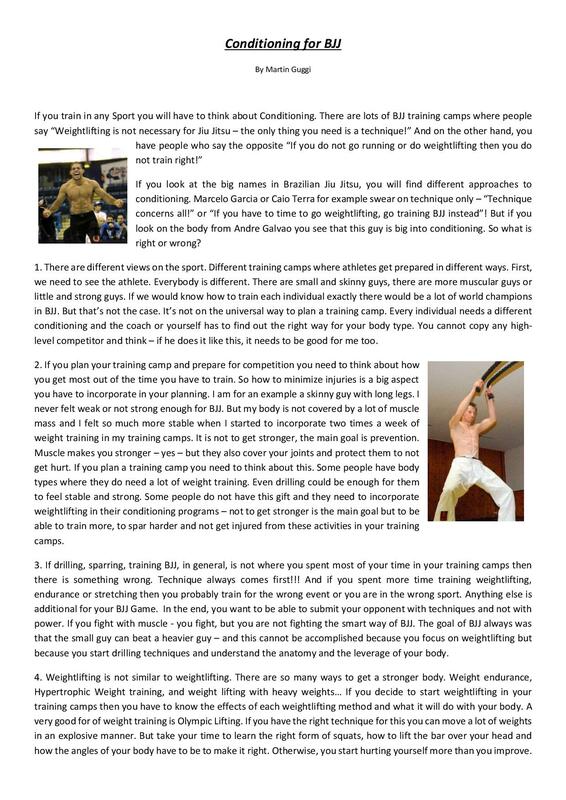 If drilling, sparring, training BJJ, in general, is not where you spent most of your time in your training camps then there is something wrong. Technique always comes first!!! And if you spent more time training weightlifting, endurance or stretching then you probably train for the wrong event or you are in the wrong sport. Anything else is additional for your BJJ Game. In the end, you want to be able to submit your opponent with techniques and not with power. If you fight with muscle – you fight, but you are not fighting the smart way of BJJ. The goal of BJJ always was that the small guy can beat a heavier guy – and this cannot be accomplished because you focus on weightlifting but because you start drilling techniques and understand the anatomy and the leverage of your body. Weightlifting is not similar to weightlifting. There are so many ways to get a stronger body. Weight endurance, Hypertrophic Weight training, and weight lifting with heavy weights… If you decide to start weightlifting in your training camps then you have to know the effects of each weightlifting method and what it will do with your body. A very good for of weight training is Olympic Lifting. If you have the right technique for this you can move a lot of weights in an explosive manner. But take your time to learn the right form of squats, how to lift the bar over your head and how the angles of your body have to be to make it right. Otherwise, you start hurting yourself more than you improve. If you decided to start some conditioning. Start with functional movements which are similar to your BJJ moves. There is some good movement method where you can start conditioning yourself and train BJJ moves. The main focus for in your training camp should always be your core. Think of a tree – first, you need a strong trunk before your start training the branches. If you have a strong core and start with your extremities then train your roots first because they will carry you. A plan like this: 1) core 2) legs 3) arms. But never forget weight training is only one aspect of your conditioning and perhaps stretching is more important for you than weightlifting!!! If you want to loose weight or you start to compete in an absolute weight class conditioning can be very helpful. To start losing fat only training techniques could sometimes not be enough. Then conditioning could help – but then also your main goal is not only to improve in BJJ but also to get a better body feeling. If you want to compete in a higher weight class or in an absolute weight class your training preparations have to change. Now you will fight a more heavy guy than you are and up to some point, his weight should not be a problem. But if he gets too heavy this will be a problem also for the most technical guy and then weight training could help him. Again the first goal is to not get injured by heavier guys. When to use power in a BJJ fight? We all know that the goal is to win because we are more technical than our opponents. That means we have to fight in a more technical way than the other guy. We cannot muscle our way to the submission even in the beginning of our BJJ career we all tried it at some point… hopefully not too long and our Professor changed the way of our attitude and we started to fight without using power. The way how to move right, the timing with the right technique is the main focus but if you have the submission you can use power to get the tap. If you get to the point where you can finish you sometimes need to force the submission. But this should be the only time where you should use power instead of technique. Last important point on conditioning for BJJ is the level you compete in. In the beginning, all you should concentrate on is how to improve in a technical manner. If you train for a long time this should still be the main focus but then weight training could help a little bit. If two athletes are on the same technical level the guy with the better condition is going to win. Do not get confused by this. This still means you always have to focus on technique but for high-level athletes, conditioning could be a little extra help. Create your training camps for your own BJJ needs. Your body is different than any other body and you need individual programs to improve. If you do not focus on your technical improvements you do something wrong. But somebody types need more than just training technique – first, you have to have a body where you can train longer, where you do not get injured and feel stable – for this weight training can be helpful. At the end of the day, the technique will always win – but training camps need to be individual for any personal need.